I’d wager a bet that no other fruit works quite as hard as the little lemon. And I know hard workers. I watch them from my couch all the time. How many times have you juiced half a lemon for a meal and then watched coldly as the rest of it went to waste? Let’s put a stop to that right now. Let’s start using lemons to their full potential. Let’s make every lemon we use a success, an over achiever … a winner. Here are 19 things you can do with your leftover lemons. I’ve done almost every single one, and can attest to the yellow fruit’s mighty power. Throw it in the garbage disposal. At the end of the evening, after dishes are rinsed and bellies are full, put half a lemon in the garbage disposal. Run hot water for a few seconds, and then run the disposal for a few seconds to lightly chop the lemon. Then leave it there overnight and finish the job in the morning. Quickly clean a microwave. 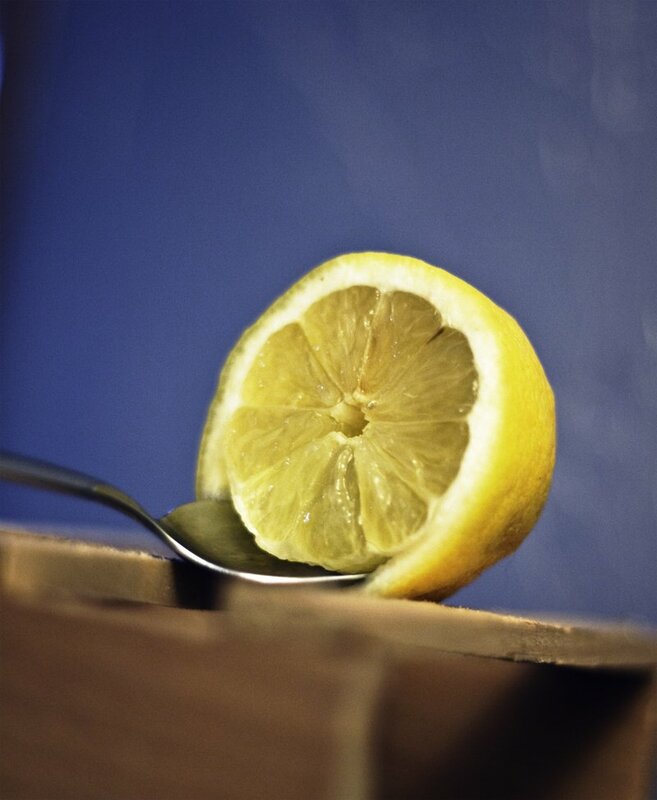 Squeeze the juice out of half a lemon and put it in a 1 cup of water in a microwave-safe bowl. Run the microwave for 5 minutes. The lemon juice steam majorly cuts down on wiping-off time. Whiten clothes and fabrics. As you’re filling your washing machine with water, dump 3 Tbsp. juice in and let it do its job. Soothe sunburns. Rub half a lemon (or even the cut side of a juiced lemon) over achy burned spots. Soothes on contact! Scrub stuck-on food. Pour a little salt on half a lemon and go to down on the crusties left over from cooking. This was especially helpful on the glass pan full of baked spaghetti I left in the oven for far too long. Get rid of corny feet. If you’re blessed with corns on your feet, try cutting a tiny bit of lemon peel. Rub the white side over the corn and then tape it to your foot for a few hours. Repeat if necessary. Banish greasy hair. After conditioning your hair, use 2 Tbsp. and 3 cups water as a final rinse. Beautiful, darling! Freshen musty areas. Remove the meat from half a lemon slice and fill with salt. Stick it in stink-prone areas, like we covered in this post. Freshen the whole house. Toss some lemon peels in a pot of water and let it boil gently until the water’s gone. The whole house is now lemony fresh. Wash your face. Add lemon juice to two slices of cut cucumber and wash your face with it. Soothes, clarifies, and brightens skin. Whiten and brighten fingernails. Either juice half a lemon in a small bowl of water and soak your fingernails in that for 10 minutes, or just put your fingernails directly into a juiced lemon and let them sit for a while. Finish with a vinegar rinse, and your fingernails are stronger and brighter! Sanitize a cutting board. Run half a juiced lemon over your cutting board/chopping block after you’ve washed it. Not only will this sanitize, but it’ll help fade stains. Whiten discolored elbows, heels, and knees. Just rub half a juiced lemon over the spotty areas and watch them disappear. Add highlights to hair. Who didn’t try this as a kid? But it works! Select small chunks of hair to highlight and rub lemon juice on them. Stay out in the sun for a couple of hours. Beach bunny, that’s what you are. Quickly clean stuck cheese off a grater. I used to spend many eye-rolling minutes trying to get mushed in cheese off the grater. Not anymore. Just rub half a juiced lemon over the stuck-on spots, and they quickly unstick and clean. Lighten age spots. Wherever you have darkened spots of telltale aging, dab a little lemon juice for a couple of days in a row. Lightened. Vanishing. Done. Get rid of dragon breath. Squish a little lemon juice in a small bit of water and swish it around in your mouth for a few seconds. Swallow for extra freshening, for aid in digestion, and for a nice jolt of vitamin C! Make your own fruit and veggie wash. I have yet to try this, but it sounds so promising – and CRAZY inexpensive! Mix together 1 Tbsp lemon juice, 2 Tbsp vinegar, and 1 C. water. Go to town on your fruits and veggies before eating them. One reminder: Lemon juice increases sensitivity to sunlight, so don’t go gallivanting about in the daylight after using it on exposed skin. I don’t own but happen to know about a book called Lemon Magic: 200 Beauty and Household Uses for Lemon Juice. Clearly, my list has fallen short of 200. I’m leaving out a bunch. Do you have any favorites I’ve left out? I am going to try the age spot trick. I am sorry to say that I have that problem. Lemon juice and baking soda is great for cleaning a glass top stove. I’m going to have to try the lemon thing on my stove. Oooh. And on my burners! Those are the worst. Thanks for the idea! My favorite use for lemons is homemade lemon bars. Yum! But I always buy too many lemons … mostly just cuz they’re so darn pretty. I plan to try your fruit/vegie wash with the next orphaned lemon or two! Thanks for the tips! Haha. I can see how that would be a favorite use! In fact, I think you should favorite use it right straight into my mouth one of these days. Lemme know how the fruit/veggie wash goes for you! I can so relate to throwing away the moldy half a lemon, every freaking time. I dare not try the hair trick because I’m having flashbacks to using “sun-in” in junior high and it wasn’t purdy. I thin I’ll try it on the pesky age spots on my hands. If I can get them looking 65 instead of 85, I’d be thrilled. Yeah. With you on the Sun-In. I wasn’t so bright (or was, as the case may be) back in the day. I have dark hair that trends toward the red side anyway, had a perm in 8th grade, and used Sun-In. Puke-orange frizzy curls for months. I think I finally had to cut it really short to get rid of it. So weird that y’all are talking about Sun-In, I actually posted a Sun In horror story today. Horrid! And one more thing, I use a lemon half and salt to scrub our old glass top stove top. 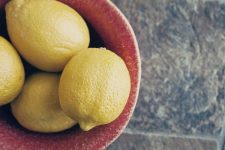 I am feeling particularly crunchy tonight, and quite proud of myself because I have actually heard of and tried a few of these lemony solutions. But I admit I am skeptical about the whole acne treatment idea. I have two tweens who are starting to produce pimply pockets on their cheeks and noses. If this works, you will hear about it. I can’t afford Clearasil for two. And since my microwave and glass baking dishes are sources of great frustration, I will be testing these also. Thanks Betty. I don’t know how you keep this all so lemony fresh. Okay, between you and Jessica below, I’m bound and determined to do a post about acne soon. I have a ton of stuff. But, notably, I started getting a nasty, big zit on my chin the other night and caught it before it got out of control. All I did? Dab a little lavender essential oil on it and leave it overnight. Gone in the morning. So there’s one other idea! And I have a meyer lemon tree that might…MIGHT…give me lemons this year. Aren’t I all with the green thumb? 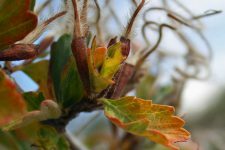 Does having a tree in your backyard give you a green thumb? I don’t know how all those things work. But I’m willing to afford you a Martha point or two for that. And I’m SO jealous of your lemons, if they come in. You must make things with them, things to go in your mouth, too. And you must blog about them. THAT will give you, like, 3 billion Crunchy Betty points. And those … yeah. You know what they’re worth. Add ingredients mentioned above to a boiling water. Boil 1 to 2 minutes, until peel is soft. Remove from heat, let it cool, then strain. Awesome! I’m going to have to try this very, very soon. Even if it does take me all day to figure out how much 250 ml of water is. Not so good with the math here. Stir, fizz, and drink…so yum! I have to admit, I have this ridiculous craving for soda every once in a while, and more often than not, I’ll just walk down to the local market and get a Diet Dr Pepper. Horrible, I know. But it’s the bubbly that I’m really after. And I think you just cured that. If you’re into bubbly try mineral water like Perrier. I put a squeeze of lemon int that, or lemon and lime, and it’s like a soda! You could also put other juices and it’s like a spritzer. I too like to have a soda now and then. It’s usually about once a month, and it’s not the HFCS containing kind. I went looking for an article on uses for leftover lemon peel and it bought me back to this post, 2 years later! LOL I wanted to leave this comment because I have another cure for your occasional soda fix which I am so into lately- kefir water! have you tried this? It turns out fizzy and so delicious…and has so many benefits because it’s a probiotic drink! I love it for the microwave and counter tops. It just smells so good. I’m going to have to try it on my breakouts. I’d love a crunchy post on dealing with acne. Please? Acne post, coming right up. Knowing me, it’ll be the next one coming … and I think the next one coming will be WITH THE NEW BLOG DESIGN YAY! But, like I mentioned to Kim above, I started getting a pimple on my chin the other night. You know, the kind that’s deep and big and you KNOW is going to get picked at when you’re not thinking about it. I dabbed a little lavender EO on it after I washed my face, and it was gone the next morning. Gone. Vanished. Kaput. Like, a miracle and all that. Yay! Thanks! Can’t wait to see the new design. Will be getting some EO this week. I know, how do I not have any? Hi! New reader here…I love this post! I am gonna try the fruit/veggie wash for sure! Hey, lady! Glad to see you here! You’ll have to let me know how it goes when you try it. I’m anxious to hear the results (mainly because I haven’t tried it yet, and I have no fruit or veggies in the house that need to be washed … waiting for farmer’s market on Friday). One word… zest. If I’m gonna juice it, I zest it first. If I have no use for the zest right away, I dry it first and then freeze it for later. Hate to waste! Thanks for all the great suggestions! You’ve taught me so much about putting things in my freezer. I’d have NEVER thought of this! I also use lemon to treat headache. For this, apply on the forehead lemon juice compresses or lemon slices. You can use lemon juice in your toilet to make it smell better and to disinfect it. When used in conjunction with baking soda you might even get toilet rings out. I know this is an older post, but I’m compelled to add here anyway that a good thing to do with lemons if you bought a whole bunch of them but don’t need them right away is to store them in a ziplock back in the fridge. A whole lemon in a ziplock bag will keep pretty much indefinitely. True story. i know this is older but can i suggest squeezing over cut or half eaten articles (kids!) to stop em going brown and dried citrus peelings work for firelighters 🙂 love your work crunchy peeps!